Robust biennial herb from a stout whitish taproot, with a disagreeable odour, especially when crushed; stems erect, freely branched, purple-blotched, hollow, 0.5-3 m tall, glabrous, glaucous. Stem leaves pinnately dissected, fernlike, with small ultimate segments giving the plant a lacy appearance; leaf stalks enlarged and sheathing at the base, the blades 15-30 cm long. Inflorescence terminal and axillary in many compound umbels; flowers white; involucral bracts small, lance-shaped. Egg-shaped, somewhat flattened, 2-2.5 mm long, glabrous, with prominent, raised, often wavy ribs. Wet to mesic ditches and disturbed sites in the lowland zone; locally common in in SW BC (known in the Victoria area and Vancouver) rare in SC BC; introduced from Europe. This is an extremely poisonous introduced European species in the carrot/parsley family (Apiaceae/Umbelliferae) that can be fatal if ingested. Because it is so toxic, it is important to carefully consider the key characteristics when making an identification. 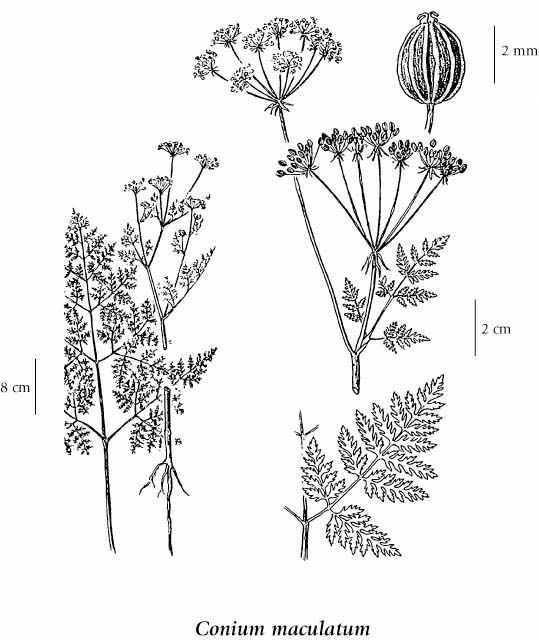 This is the plant that Socrates used to kill himself (Pojar and MacKinnon 1994). Pojar, Jim and Andy MacKinnon. 1994. Plants of Coastal British Columbia. Lone Pine Press, Edmonton.